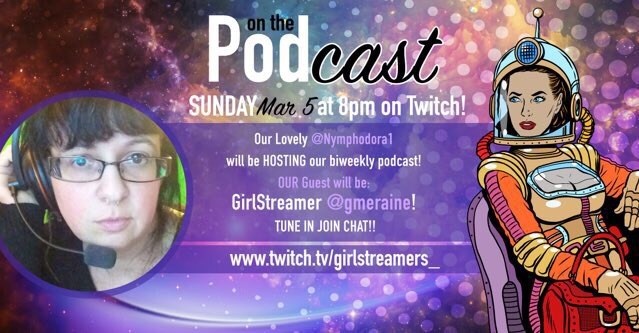 Mark your calendars this Sunday March 5th 2017 I’ll be live on the girlstreamers podcast ! Come join me live and discover all about the gamer side of me. So freaking nervous but I know I’m in good hands and I hope y’all will be able to join us live on Twitch that night. If not I’ll post a link to the archive VoD when it’s available. So I was asked to join a team by Good4Gaming and participate in Extra Life this year with my gmeraine Twitch channel. I said yes and would really like your help in fundraising for this amazing cause. You can go to my Extra Life page and donate at any point before midnight ET on November 5 2016 to help make this happen. This also happens to be my birthday, so I’d like to make it the best one ever by helping out this amazing cause! I also wanted to mention all my gaming related social media is now all using gmeraine. I love the klutzy gamer but I want to make it as easy as possible for you to join the rainestorm.